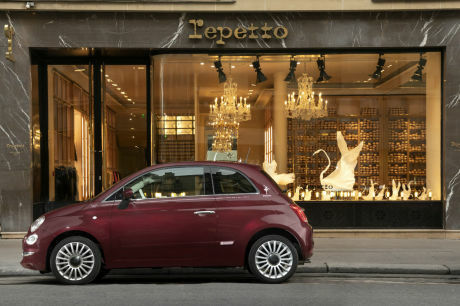 The Repetto is the new special series available on the Fiat 500. Its rates start at 18 490 €. And a special series for the Fiat 500 ! The Italian firm joins forces this time with the brand of ballerinas Repetto for this 500 very chic, with prices starting at 18 490 €. With the Mini models, the Fiat 500 is definitely the car to be declining the most in a variety of special series. While we have already spoken recently of the series Spiaggina’58 and Collezione, today is the Fiat 500 Repetto, which is presented to us. Fiat partnered for this special series of the famous French brand of ballet slippers Repetto, founded in Paris in 1947. As its name indicates, this new special series has been designed in collaboration with the maison Repetto, famous for its slippers of dance and ballet flats. It is distinguished by its exterior paint Opera Bordeaux as well as the brand logo on the back pillar, embellished with the silhouette of a dancer. The treatment of the interior contrast with its leather upholstery Poltrona Frau ® color tobacco as well as its combination of instrumentation and its sky roof, ivory, while the dashboard takes up the hue Opera Bordeaux. It is a numbered plate between the seats, this special edition is limited to 500 copies. It should be noted that the panoramic sunroof is part of the standard specification. Finally, to accentuate the exclusivity of this version, each 500 Repetto is delivered with a box including a pair of ballerinas Repetto, as well as a perfume and a key ring from the French brand. This special series is available with two petrol engines 1.2 69 hp and 0.9 Twinair 85 hp, the first offering a choice between the mechanical box, and the box with the robotised Dualogic. The prices of the Fiat 500 Repetto started at 18 490 €, which makes it one of the versions the more expensive of the urban Italian. It can be ordered today.